Scenario: You arrive at the scene to find the patient obviously deceased and the family member present said that the patient had a heart attack in his sleep. In this scenario, you did not attempt to resuscitate the patient. 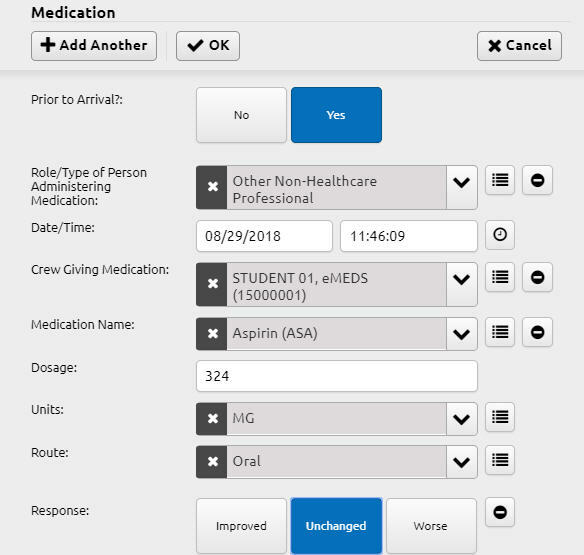 Here are the fields you will need to change in Elite that differ from the typical patient report, but this TechTip does not address all of the other fields you should be filling in that are typical of any call in your talented report writing skill. Scenario: You are a career officer or LFRD training coordinator and need to check off some of your personnel in a tech training subsite for the training project of the month. (Note: Only some of the subsites offer this capability; some check-offs are based upon the individual completing a course on his/her own.) Examples include Alzheimer’s training and IRP-Spec Ops (technical rescue and water rescue). Go to the site, either by direct link (as provided in an FCGO or direct e-mail message from the Ops chief, for example) or via the tech training website chief section (lower-right corner of the chief main page – see the bullet list). Select the name of the course for which you would like to provide credit to your personnel. If you are on the career check-off page, please also select the battalion and shift. (Personnel not located in Battalions 1-5 are assigned to Battalion 99.) if you are on the volunteer check-off page, select the LFRD. Click the checkbox next to any name you would like to provide credit. Repeat as needed until all of the personnel in that battalion/shift or LFRD for which you want to provide credit have check marks. Click the Check Off Students button. Repeat for any other battalion/shift combinations or LFRDs. Remember to log off of the site when you have finished by clicking the Logout link, located toward the top-left of the page. Scenario: Your patient is unconscious and has no ID in his wallet. Aside from being the worst mime act you have seen today, you have no information on him. How to record his name in Elite? Instead, remember that you have options (Refused for people who refuse and Unable to Complete when you just don’t have the name and he is incapable of providing it). Click the No/Not button next to the First Name. Click the appropriate choice thereafter. Repeat for the Last Name field. Then again, if you actually run the real John Doe to the hospital, you should record the name. You just may want to reiterate in the narrative that it’s his real name. Scenario: Your patient has a bottle of medicine that you need to record but one that is not in Elite. There’s no Other option in the drop-down list. How should you record it? Click in the Other Medical History input box and add the medicine(s) there. Follow this up with e-mailing the name of the medicine(s) to Tim Burns (Tim.Burns@montgomerycountymd.gov) and he will have the medicines added to the Current Medications drop-down list. Please double-check your spelling. Scenario: Your patient has declined (however forcefully) to share his/her phone number with you and it’s a required field in Elite. What to do? If you leave the field blank: You will lose five (5) points toward your completion total. If you type all 9s (999-999-9999, consistent with the SSN approach): You will not lose any points toward your completion total but you will still get a validation error, which explains that is it preferable to get a valid phone number. 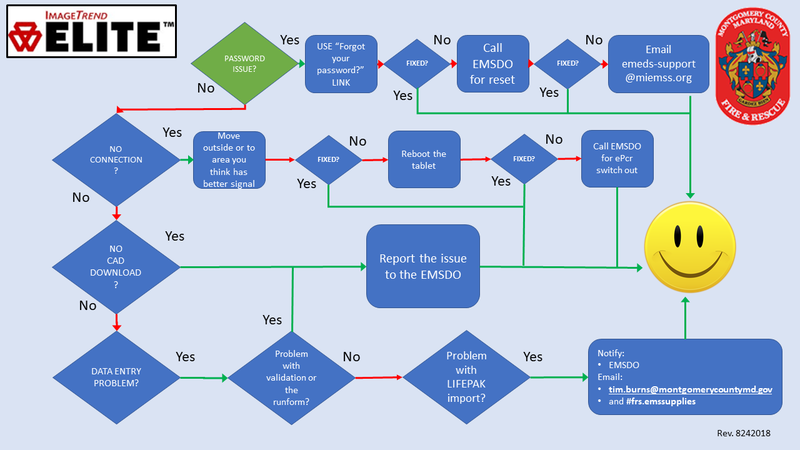 Scenario: You are an ALS provider who needs to report a downgrade in Elite. The BLS provider has transported the patient in his/her ambulance and you intend to try to return to Station 8 without being dispatched. What do you need to report? Ensure you are writing the report with the Unit/Call Sign as the ALS unit on the call. Switch to the Call Info menu and Disposition tab to change the Primary Role of the Unit at the End of Incident to Non-Transport-Other Reason and The Treatment & Transport Disposition field to Operational Support Provided – Patient Contact (if there was PT contact). Remember, just as with the previous version of eMEDS, you still need to write a narrative to explain why you chose to downgrade the patient. Scenario: You have recorded 999-99-9999 for a patient’s social security number and Elite is flagging you with a red field. MCFRS now would like you to capture the patient’s medical record (MR) number whenever you transport and you are unable to obtain a valid social security number. The MR number is located on the patient’s wrist ID that hospital staff put on the patient. Where to enter the MR number? Select Hospital Medical Record Number – Receiving and input the number found on the patient’s wristband. Click the My Incident button in the top navigation. Click Monitor in the left-hand navigation. Click Filtered in the left-hand navigation and then the Filter button at the bottom of the screen. Click the Status Monitor drop-down field arrow and select Monitor. Click the box for Priority. Click in the Operators field and select Less than. Type in a Value of 9 (or check the box for 9, either is fine). Refresh the list whenever you need by clicking the Monitor button in the left-side navigation and then the Filtered button beneath it.